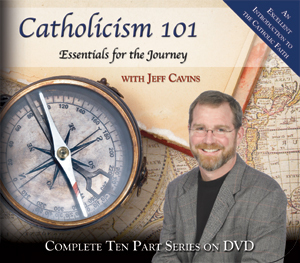 Jeff Cavins explains the basics of Catholicism in ten dynamic 60-minute presentations. Drawing upon the Bible and the Catechism of the Catholic Church, as well as entertaining personal anecdotes, Cavins makes the Catholic faith come alive. Perfect for a parish Bible study program. Order from St. George Catholic Books and Gifts.